It won’t be long before the leaves begin to fall and cover our yards and gardens. But you don’t necessarily need to put them all in a burn pile or recycling bag. Leaves can have a positive impact on your lawn and garden. 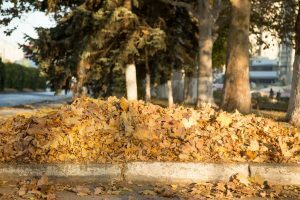 Most municipalities have annual leaf pick up where you can either rake leaves out to the curb or where you can bag them to be picked up. But there is no need to get rid of leaves in the first place. Leaves are the perfect mulching material. Save your money on both leaf mold and mulch by keeping your leaves. Use them as mulch to protect your soil first in the winter and then use them in the spring as an excellent weed barrier. Leaves should be piled on the vegetable garden that has been vacated by summer crops and also used to protect any fall vegetables. Place mounds of leaves around plants when frost or freezes threaten: they work as well as sheets, blankets, or cloches on established plantings and are easier to handle. Pile leaves around berry bushes, fruit trees and use them as insulation around flowering shrubs. This helps protect the plants from the winter weather and will also keep them from warming early and flowering too soon in the spring. Early frosts can kill swelling flower buds thereby reducing the number of fruit. When mulching fruit trees, don’t pile leaves up around the trunk, but instead pile leaves out one foot from the trunks and out to the drip lines. Do not to place leaves close to the trunk because rabbits or mice like to burrow down into the leaves. If the leaves are too close to the tree, the rodents are more likely to gnaw on the bark. In addition, insects which may be harbored in the leaves may also decide that they are hungry enough to eat your fruit tree bark. If the look of leaves has you turning up your nose, lay a thick layer of leaves and cover them with a thinner layer of your favorite mulch. The idea that oak leaves will not break down is a myth that I have proved in my garden over and over again. They just take a little longer to decompose than other lighter mulches. My gardens have always been rich in black soil complements of truckloads of leaves that are primarily oak leaves. Contrary to popular believe they do not acidify the soil either, you just need to be certain that you have plenty of nitrogen in the form of manure to break the leaves down into rich, dark soil. Leaves can also be used as bedding material for livestock. As the leaves are falling from the trees, add them to the stable, barns and chicken house. Cover the floors with them. In the spring these leaves will have held lots of animal urine as well as the manure. During the course of winter the leaves will create a sheet that easily separates the composting manure from the floor. Use a flat shovel to remove and place them in a composting bin for further decomposition as well as assisting with composting other household and yard wastes. Leaves are especially good bedding in the chicken house. The chickens love scratching in the leaves and will also eat any bugs or bug pupae that may be in the leaves. For this reason, it is also a good idea to allow the chickens out into the garden area during warmer winter days so that they can scratch in the leaves and reduce the number of insects making the garden their winter homes. During the growing season, layer leaves into your compost. One of the big contributions that leaves make to the soil is adding carbon that removed from the air to aid in photosynthesis. One of the biggest complaints that most people have about composts is the smell. Compost smells exist for two reasons. One is the pile was anaerobic and you just exposed it to air. Or there is too much nitrogen (manure or rotting garbage) in the compost. This can be solved by adding more brown carbon rich materials and leaves are a brown carbon rich material. Not only do leaves provide the brown material for the compost, but they also provide nutrients from deep in subsoil. These nutrients are brought up through the tree roots, up the trunks and into the branches and to the leaves where they are stored until released back into the compost and then into the topsoil of your garden. Even if you do not have the time or the energy to rake and utilize leaves in other ways, mulching them into the lawn is a good way to dispose of them. 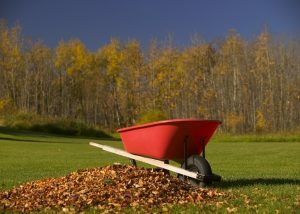 The more you shred the leaves, the more quickly your yard can utilize the nutrients supplied by the leaves. Donna Brown is the author of the gardening book Simply Vegetable Gardening which is available on her website: Cygnetbrow.com. She can be contacted at cygnetbrown@gmail.com.